Wanted to start highlighting some content in Ableton format for all the Push and Live users out there. Figured I’d start with one of my favorite companies, MSX Audio, this is the last installment in their Sammich Kit series. If you’re not familiar, this series is all about giving you a grab bag of usable content, no fluff, making sure each sound is useful. 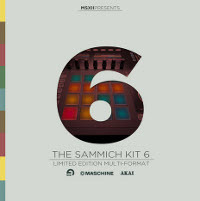 To cap off the series they did one in multiple formats which includes Maschine, MPC, and Ableton Drum Racks. *Get exclusive tutorials, bonus downloads and more when you join today!